It’s my dream. To be a wife and mother. It’s all I’ve really wanted out of life. It is a literal dream come true. My husband and I recently found out that we’re expecting. AND it’s nothing like I thought it would be. Morning sickness is terrible. I feel sick all the time. For a week and a half, all I could keep down was mac n cheese. Even though my diet had expanded now, the “wrong cereal” (as decided by the baby) or stepping out into the heat can cause me to throw up at the drop of a hat. I feel gross and tired and emotional. I feel bloated and it’s really hot in El Paso right now. Moises is being a trooper. He’s helpful, understanding, and he holds me when I cry (even if I’m crying for no reason). This thing that I’ve wanted for as long as I can remember is actually happening and I can’t believe it. It almost doesn’t feel real, even with the constant reminder that the nausia has become. And for the first time in my life, I’m questioning whether or not I’m ready to be a mom. Am I prepared? Am I really ready or have I been lying to myself all this time, thinking that I was going to be ready and the best mom there ever was the second it happened? I don’t feel ready. I don’t even feel like getting out of bed or waking up most days. I’m so tired all the time, it’s almost difficult to function. And I felt guilty for a while because I don’t really feel attached or connected to the baby yet. I’ve since heard that it’s normal. It’s typical to not feel that connection until you feel the baby moving. Even knowing that, I wonder why my dream come true doesn’t illicit a greater emotional response. Or maybe it does, but I don’t know how to label or process those emotions yet. The first time I felt the excitement I expected was two days ago. 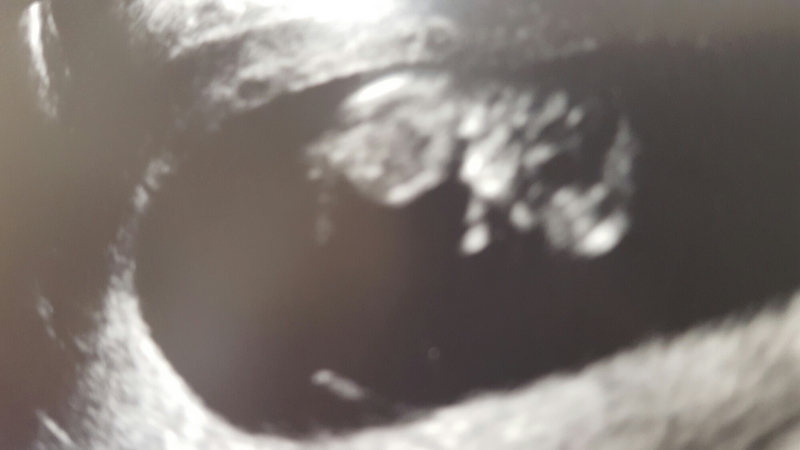 I almost cried when I saw the baby’s reaction to my giggles during the ultrasound. He/she moved around like crazy. It felt like the baby was happy that I was happy. And it was magical. As happy as that appointment was, it brought up old concerns. The fact that HFA runs in my family is almost scary. I still don’t 100% know how Moises and I will handle having a child with AS. Especially with how often we will be moving around during his career in the Army. Uprooting a NT child is difficult enough. How much more difficult will it be to move every 4 years with someone that understands less and is less equipped to deal with the changes? When push comes to shove, I know we’ll do our best. Who knows? A HFA child may have a better chance at a happy and full life because I am the way that I am.